Tapper pushed back and asked him why he is cosponsoring a bill that he doesn’t agree with, noting how the bill would essentially do away with private health insurance. “Would you vote for this bill if it came to the floor?” Tapper asked. Swalwell said that if the bill came to the House floor, he would offer an amendment for a public option, adding that he doesn’t believe perfect should be the enemy of the good. Tapper followed up to ask him whether he would support the bill if the amendment didn’t pass. Rep. Tim Ryan (D., Ohio), who also recently announced he was running for president, shared a similar sentiment on private health insurance. Earlier this week, he said people should not be taken off their private health insurance plans “if they enjoy it,” which pits him and Swalwell against other Democrats who support eliminating private health insurance companies. Sen. Bernie Sanders (I., Vt.), who is running for president and recently introduced his path toward universal health care, has been one of the most strident 2020 Democrats when it comes to eliminating private health insurance. 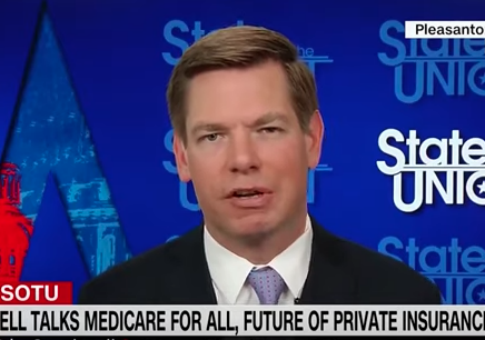 The post Tapper Challenges Swalwell on Medicare Bill He Cosponsors But Doesn’t Fully Support appeared first on Washington Free Beacon.